Being in a big family where everyone quite possible has a big appetite and just do not succumb to having 1 dish for dinner, fridge space is extremely important. My mum’s a vegetarian, I bake alot, and I do cook meat at home too. So what happens is that we have 2 fridges, one for everyday stuffs for cooking like vegetables, meat, fruits, herbs, sauces, etc etc etc. And another fridge, there’d be also sauces and stuffs but mainly vegetarian stuffs. My cake stuffs are occasionally here and there. Even in the freezers, we segregate meat and non-meat items. That’s the good thing about having 2 fridges. I think it’s normal nowadays to have 2 fridges in a household. And just yesterday, I realized one of the bigger fridge wasn’t cold. Ok .. maybe cause it’s being opened and closed too often. So the next morning (or rather afternoon) I woke up and went to check the fridge. (Hahaha I’m lame like that I check the fridge) It’s not cold at all!! DAMNIIIIIIITTTTTT !!! It’s just not fair!! Come’on!! Stupid fridge has to breakdown every 1.5 years? I mean, really!! It becomes problematic every 1 1/2 years to 2 years. And this fridge is probably only 7-8 years. It has probably been in the hospital for 3-4 times. No good. Stupid fridge. I hate you. I know, it’s unrelated but I just had to rant about the fridge. And now please just look at the cupcakes. Actually …. I think …. I’m going to have some problems with the freezer because I just don’t think there’s enough space. And while I was cleaning up the fridge just now, both of them. I think I threw away a truckload of things. Just too many “I don’t know what is that but I’m just going to throw because there’s no space and mom isn’t going to find out” moments. I used to have an uncle living with us for a couple of years and he claims his space in the fridge. And he has these eeeww stuffs like preserved thingys in jars and uncolour-friendly stuffs. My maid told me which stuffs were his (He has moved out already anyway) and I just threw all of them away. Please be considerate. If you move out from someone’s house, it’s just not necessary to keep your rubbish with them. Anyway, no fancy baking until the fridge is fixed because there WILL NOT be space for it. Preheat oven to 165 C. Line cupcake tins with papers. Melt chocolate and butter over a double boiler. Be sure to cut them into smaller pieces to ensure them melting evenly. Add in caster sugar and stir till dissolve. Remove from heat and pour into a mixer. Beat mixture for 3 minutes on medium speed. Add in eggs one at a time making sure it’s well mixed. Measure and sift flour, cocoa powder and baking powder in a separate bowl. Fold into the chocolate mixture and stir well. 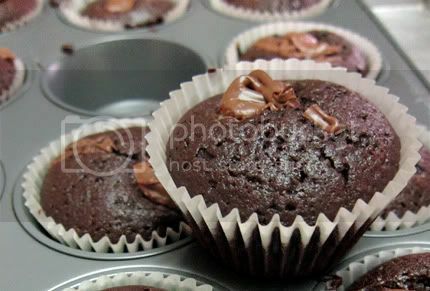 Scoop into cupcake cups and add in 1 teaspoon full of Nutella on top of the batter. Bake for approximately 20 – 25 minutes or until skewer comes out clean. Heat cream in a saucepan and pour into a bowl of chocolate. Again, make sure the chocolate are in small pieces so it melts quicker. Stir till chocolate has melted and add in a small knob of butter for that silky smooth texture. Cover and let it rest till the cupcakes are ready. 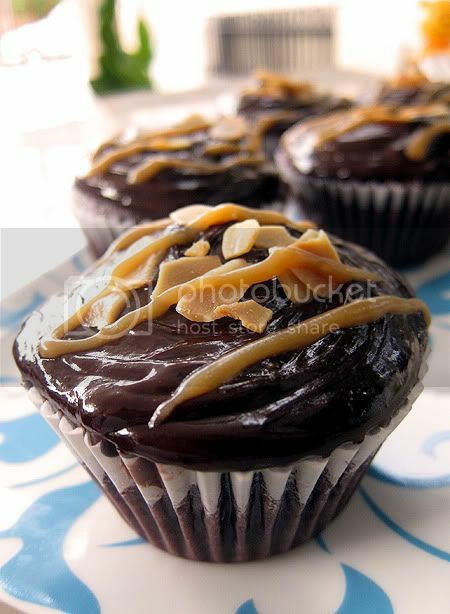 To assemble, pour a dollop of ganache on top of the cupcakes, add in some toasted almond flakes and drizzle with some salted butter caramel sauce. haha.. it's so funny when I read your rant about fridge. Reminds me of mine. Like what we chatted yesterday, I throw all my mum's stuff off, and she wouldn't even notice it. I don't even think she remembers what she buys and it rots in the fridge so often, I'm doing her a favour. What lovely cupcakes! An irresistible treat! Well, fridge or no fridge problems – these look fantastic! 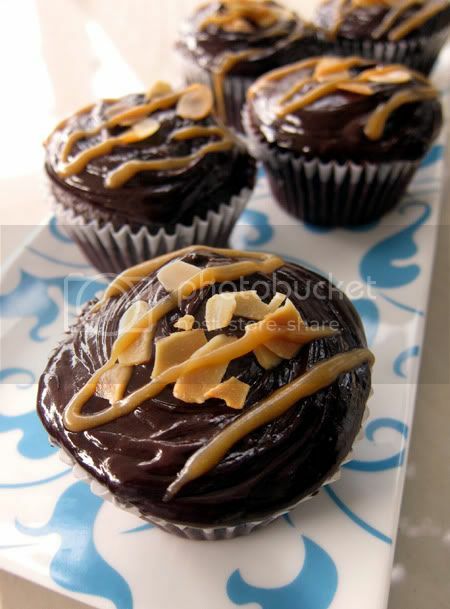 Nutella plus salted caramel sounds like a match made in heaven. what's the brand of your fridge? I plan to get 2 fridges as well for my new house. i could use an extra fridge. the cupcakes look so good. i've got some nutella in the house, and now it's calling my name. Yeah, so far I've had warnings about LG and Samsung. Both brothers are having each brand. They complain the fridge causes frost with the vege and the door magnet is not working well after a few short years.